Interactive videos in e-learning can be an effective way to enhance your course scenarios, activities, and quizzes. And Articulate Storyline makes working with video super easy. Looking to get more from your e-learning videos? Here are some helpful insights for using video in your Storyline quizzes. 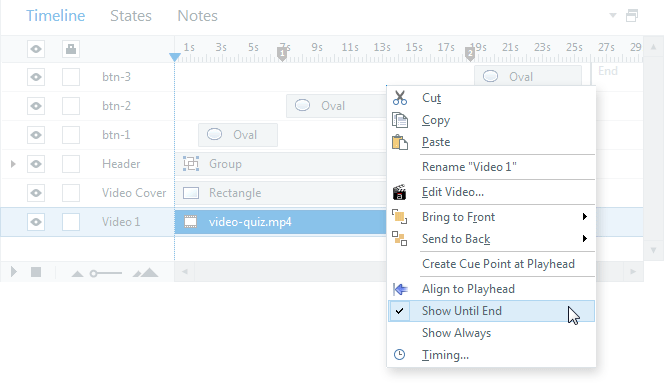 You have a few ways to bring video into Storyline. When you’re working with interactive video (scenarios, quizzes, interviews, etc. ), you will need to insert the video from a file. This embeds the video into your slide. When you first insert your video, you’ll notice that your timeline expands to accommodate the duration of the video. This is really helpful for visualizing the total runtime for your video. Your video will insert on the current frame as your playhead. Let me explain. If you insert a 30-second video while your playhead is on Frame 5, then the video will not appear until Frame 5 and will extend the timeline to 35 seconds. If you want your video to begin playing when the timeline begins, you’ll need to reposition the video to the beginning of the timeline and keep the current timeline set to 35 seconds. That’s because objects are set to Show Until End by default. Your best move is to first disable Show Until End and then reposition the video to the first frame on the timeline. This will save you from having to readjust the timeline back each time. By default, Storyline enables videos to be played and paused by clicking on the video. 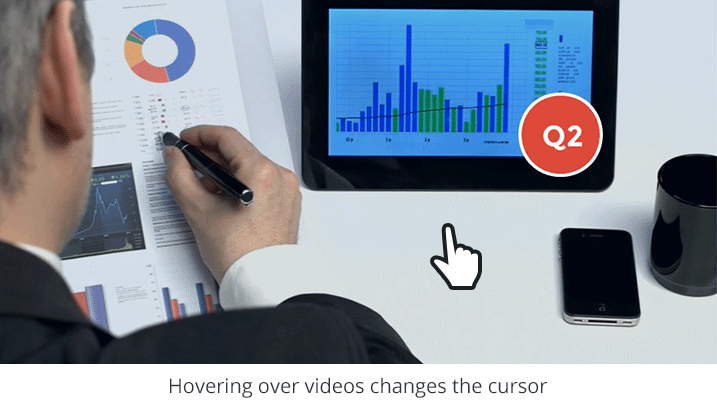 Hover over an inserted video and you’ll see your cursor change to indicate the video is active. This is by design, and there are times when clickable videos make sense in your projects. This is not one of those times. With interactive videos, you’ll want to narrow the interactivity to a button or series of buttons while disabling the clickable video. To disable the hand cursor from displaying when users hover over the video, you can overlay a hotspot or transparent shape. The benefit to using the hotspot is that you’ll get this highly visible green shape on your slide. This makes it really easy to see compared to a transparent shape. If you go with the hotspot, you’ll want to right-click anywhere on the hotspot and deselect Show Hand Cursor on Hover. In the example file I used for this article, I went with a semi-transparent shape over my preferred hotspot. The video felt too bright and a semi-transparent shape let me dial back some of the brightness. If you have a preference, let me know, okay? The trick to interactive video is to add buttons that appear for a short duration before disappearing. You’re giving the learner an option to interact with a specific frame or series of frames in the video. If the learner chooses to interact, they click the button. If they don’t click, they’re not penalized (in this example!) and the button disappears after a few seconds. To adjust the duration of a button, drag it along the timeline. Just like with videos, objects are set to appear for the entire duration of the timeline. You’ll want to drag the right edge to prevent the button from displaying the entire time. When you’re working with interactive video, you’ll likely have short segments ranging from one to five seconds where you want a button to appear. Cue points make this so easy. After you insert your video, press your spacebar to play the video on your slide. Each time you want a button to appear and disappear, press C on your keyboard to add a cue point. This gives you a visual indicator for adjusting your buttons. You have a few options for adding the quiz questions and feedback. One way would be to create new quiz slides for each question. Your buttons could either jump to each quiz slide or open them in lightbox slides. Another way is to build everything on slide layers like we did in this example. I like the idea of slide layers because it enables me to keep everything on one slide. It was my intention to make the question slides optional if the learner wanted more information or to evaluate what they knew for a specific topic. I created the first question slide as my template. Using buttons I made with basic shapes, I then created three states: selected, disabled, and hover. The submit button’s initial state is set to disabled. Since I’m not using Storyline’s default quizzes, I have to manually disable and enable the submit button to prevent the learner from clicking Submit before making a choice. To enable the submit button, I added one trigger to change the button to normal when any one of the three choice buttons is selected. Easy, right? The last thing I want to mention is the Slide Layer Properties menu. For each slide layer, I enabled the option to pause my video on the base layer. By default, the base layer timeline continues playing when slide layers are triggered. I didn’t want the video to continue playing while the learner answered each question. This is another option that will depend on your project. I can imagine video quizzes where you’re trying to create a sense of urgency for the learner. In such cases, it might make sense to let the video play while the learner is making decisions. Working with video in e-learning has never been easier and quizzes are a great place to begin. I’m writing more on this topic and will continue to share templates for quizzes, interviews, and scenarios. In the meantime, download the template and let me know what you think. If you have any questions or would like some feedback on your own video quizzes, let me know. Hi David, thanks for this post. I know it is just a demo, but do you recommend any video elements supporting the quiz material, or is it just an added element to enhance the experience? Hi Jay! I think you can take video in a lot of directions with these types of activities. This example is set up as an informal knowledge check but I could easily imagine a video scenario that branches to video-based quiz questions. For example, each marker could be a decision point that launches a more robust quiz or scenario with video questions (processes, scenarios, etc). If that helps, great. But if I missed your question, let me know and I'll get try to get you what you're looking for. Hi Hasan! So I jumped over the issue of tracking in my tutorial:-) I planned on addressing it in the video tutorials next week. So by default, quiz questions can't be inserted on slide layers. That's why this demo uses buttons and triggers to simulate the quiz. And since we're not using built-in quizzes, there are no associated results slides to insert. Thanks david for kindly respond. 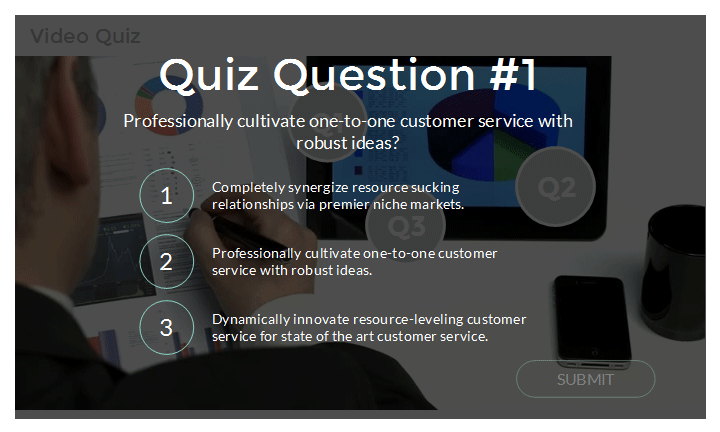 The easiest way to add trackable quizzes, is to insert your quiz questions as individual slides. Then, you would add a lightbox trigger to each button to load the slides as lightboxes. Check out Montse's video quiz demo for how that works: http://elearningdesigner.com/portfolio/interactive-video-quiz/ The cool thing about loading quiz questions as lightbox slides is that the effect is nearly identical and you can track the questions like any other question slide. Hope that helps. If you have questions, let me know. I'll nudge Montse to share her updated version. Hi Hasan - I'll ask if she'd be willing to share her file. Has there been any luck with this? I would appreciate a share as well! Thanks for letting me know! Pro tip #4: Read more of David's post. On a more serious note, thanks for the reminder of deselecting the hand cursor on the hotspot. Forgot about that one. Thanks, Daniel. I think it's safe to say we all have each other's back around here. Hope things are going well! Do you have any upcoming Lynda titles in the works? Yes, it is nice with interactive video! I am using this a lot now a days. There is however one serious feature that I miss, while stopping the video and presenting a quiz question or activity : I want to force the user to perform the activity first, before he can continue the video... in all these examples it is possible to click the seekbar to bypass the activity, or when using a lightbox, the user can just close the lightbox to continue the video. I've added this as a feature request. Hi Erik, Do you need to track learners scores? If not, you can use the slide layer approach to force learners to remain on the slide until they've completed the task. 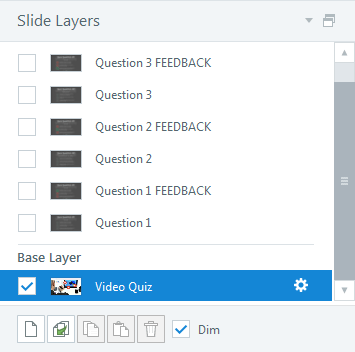 Check out Montse's example: http://elearningdesigner.com/storyline/video-quiz/story.html and click the first button: Layers (no tracking). You're right regarding the light box effect. The other solution would be to jump to a new slide for the quiz or activity and then return to the video slide. That would enable you to work with built-in scoring/tracking without loading the questions into lightboxes. This is fantastic and would be amazing for us to use. However, we are not embedding our videos in the Storyline file -- we're referencing them as web objects (our content is accessed around the world and our videos are hosted by a CDN). Any idea if we can still do something like this without embedding the video files in Storyline? Hi Jeremy - We get that question a lot from users pulling videos from CDNs. Currently, you need to embed the video so you can sync the animated buttons or pop-overs with the file. That's too bad -- I would have loved to experiment with this. Thanks Dave! Hi David - Thanks for the article. Really adds to the wow factor and can see this being used as you describe for branching scenarios. I've been having a bit of a play around and have run into a couple of issues. Firstly, I have used a random video file from Vimeo as the background to test this. I have set it up according to the parameters you state in your download. When I publish two things happen: 1. I have to click the play button on the Vimeo video to get it started. I have set the layer to play media when the timeline starts but I still have to press the play button. Can this be avoided somehow? 2. 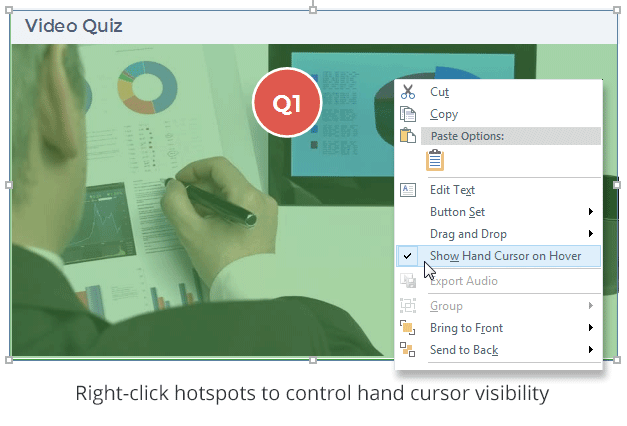 If after pressing play, I hover my mouse over the video, the buttons to show the questions ie Q1, Q2 etc are hidden ie do not appear as expected. If after pressing play, I hover my mouse off the video (not using full screen), the buttons appear as expected. I've tried various things to fix this but having no luck. Any suggestions? Thanks again. Hi David, I am new to story line and i want to create a video quiz such that its mandatory for the learners to answer the questions. And subsequently if they select the wring choice they are navigated to a help page where they are given some information regarding the same topic. I have just started working on story line. Can you give me some basic tips/tutorial as to how can i go ahead and successfully create the video quiz ? Hi David, Thank you for the great tips! I am currently using a video in one of my modules. We have little "Information" icons pop up throughout the video and the video is paused. When the learner clicks on the Information icon they see a layer that provides more information about what was seen in the video. Meanwhile, the video is paused. Afterwards, the learner clicks on "click here to continue" and the video continues until the next Information icon pops up. However, I'm running into a little issue when some of the Information icons pop up. It seems like the video starts replaying a few seconds earlier rather than when it was paused. I am having trouble understanding why this is happening, because the triggers on each one of the Information icons is the same. They are: "Pause media", "Show layer", and "Pause timeline on this slide." Any thoughts on why this could be happening? Many thanks in advance! Hi, Anna: I'm not sure exactly what the issue is--the video doesn't pause? I'm not totally sure what the issue is, but my guess it might have something to do with the timeline of a layer. The standard timeline is 5 secs. Thank you for your help, Daniel. I brought up the issue here: https://community.articulate.com/discussions/articulate-storyline/video-with-information-icons#reply-316003 and was told that this is a bug. Meanwhile I'll have to work around it by breaking up the video into little parts. My pleasure. Bugs are a hassle, but instructive in their own way. Hi Anna - If you'd like to send me your file, I'd be happy to take a look at it to see what's going on. Hi David, thank you so much for offering to help! I brought up the issue here: https://community.articulate.com/discussions/articulate-storyline/video-with-information-icons#reply-316003 and was told that this is a bug. Meanwhile I'll have to work around it by breaking up the video into little parts. Hi Alasdair - Are you still trying to get this to work? Let me know and I'll be happy to take a look at your project. Hello! This article is very helpful. 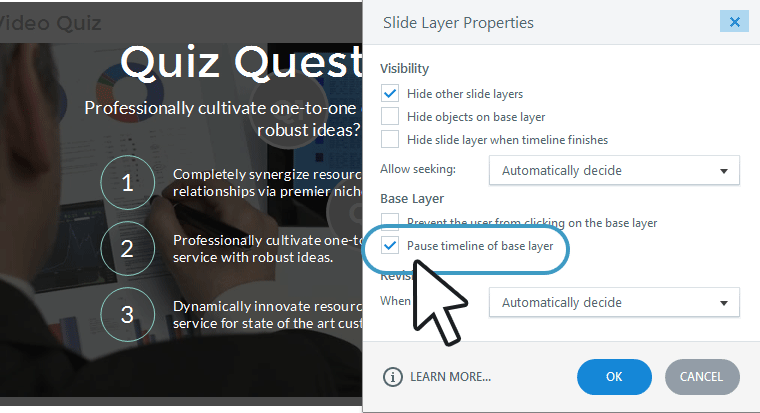 However, I'm trying to create an interactive video slide in Storyline 2 with the following features: 1) Video clip on base layer is 30 seconds long 2) 3 questions pop up, over the video, at 3 different cue points on the timeline (e.g., at 5 seconds in, 15 seconds in, and 25 seconds in). 3) Each question appears on its own layer. 4) When the layer with question appears over the video, the timeline of the base layer pauses. 5) After the user reads the question on the layer, he/she can close the layer & the base layer video resumes from where it paused. 6) The video slide has a seekbar which the user can click around in in order to navigate to different parts of the video, if desired. David: Your interactive video example for this article has buttons that temporarily appear, allowing the user to click them. When clicked, they trigger question layers to appear. However, I don't want to give the user the option to skip over a question. Instead, I want the question layer to appear automatically, once a certain cue point in the base layer timeline is reached. I've created a simple prototype (can I upload it to this forum somehow? ) with a 30-second video clip in the base layer. I've set up 3 cue points in the base layer timelines (at 5 seconds in, 15 seconds in, and 25 seconds in). When the base layer timeline reaches each of these 3 cue points, a question layer is triggered, which the user can then close to continue watching the video on the base layer from where the video had paused. The issue seems to be with the seekbar. If I start clicking around within the the seekbar, question layers are popping up when I would not expect them to because I haven't reached that point in the timeline yet. For example, if I let the entire 30-second video play & allow each of 3 question layers to appear & I close them manually & then, just before the video gets to the very end, I click in the middle of the seekbar, before the 15 second mark, I then see the Question 1 Layer. I would expect to see no question layer until the timeline reaches the 15-second mark & then I'd expect the Question 2 Layer to appear. Same if I let the video play thru the 3 cue points, allowing the 3 question layers to appear & I manually close them. But just before the video gets to the very end, I click between the 15-second and 25-second (or 2nd and 3rd cue points) in the seekbar - I then see the Question 2 layer. Again, I would expect to see no question layer until the timeline reaches the 3rd cue point at 25 seconds & then the Question 3 layer should appear. Thus, is it possible to have a bit more precision over when various question layers appear, depending on where in the seekbar the user manually clicks? If the user clicks in the seekbar before a cue point, no question layer should appear until that cue point is reached again. Is it possible that the seekbar not play well when you have an interactive video with layers? I wanted to retain the seekbar because the videos I'd like to eventually use are closer to 5 minutes long each & I wanted to allow users the freedom to navigate within them, if desired. Thanks much! Hi, David! There is another way to add trackable quizzes, instead insterting quiz questions as individual slides as lightboxes? Thanks in anticipation of a reply.